SPRING CITY, Pa. — Since the last residents left more than 20 years ago, Pennhurst State Hospital has been vacant, its sprawling complex of buildings crumbling, overcome by brush in the suburban Philadelphia countryside. The old asylum may not be still much longer. It's being filled with fake skeletons, hanging torsos, coffins, exam tables and other frightful things as new investors plan to begin redevelopment efforts by turning it into a haunted house set to open Sept. 24. The plans have stirred more than old ghosts. The mental health community, which has long fought to preserve the hospital as a relic of the bygone era of institutionalization for people with mental disabilities — a reminder of history not to be repeated — is infuriated by the plan. "I don't want to relive the hell that I went through of living in an institution," said Jean Searle, co-president of the Pennhurst Memorial and Preservation Alliance, who grew up in similar institutions but now lives on her own. "I want to try to forget." In addition, a lawyer representing several neighbors near the East Vincent Township site filed a lawsuit Sept. 20, asking a judge to stop the haunted house because organizers don't have proper zoning approval. A hearing was scheduled for Sept. 24. The old hospital is no stranger to legal and ideological battles. Built shortly after the turn of the 20th century, Pennhurst grew to as many as 3,600 residents by the 1960s. It was closed in 1987 in the wake of a lawsuit alleging years of abuse and neglect, legal action that spawned years of appeals and three U.S. Supreme Court rulings. The suit alleged that residents had been found beaten by nurses, strapped to beds, left naked or alone and drugged into stupors. At the time, its 1,200 residents were sent to other facilities and patient advocates nationwide hailed the closure as a civil rights victory. But the state was unable to sell the buildings for more than 20 years. In 2008, a group of investors called Pennhurst Acquisition, led by businessman Richard Chakejian, bought the site from the state for $2 million. Now, Chakejian is running a composting operation on the overgrown site and eyeing future development. He hasn't decided what kind, though, and first he has to get the property rezoned. For now, Chakejian wants to start with the haunted house. The event is hardly the first to be done at such an institution. Similar haunted houses have been staged at the Trans-Allegheny Lunatic Asylum in Weston, W. Va., the Ohio State Reformatory in Mansfield, Ohio, and the now-crumbling Eastern State Penitentiary in Philadelphia. 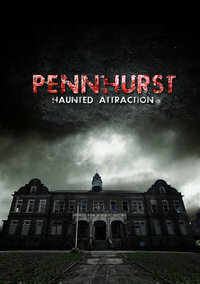 The Pennhurst event will not incorporate the idea of an asylum or mental patients into its story lines, Chakejian said. There will also be separate rooms in which people can learn the history of Pennhurst and the pain that was endured there, he said. "Society made a mistake in those days, although they were well-intentioned in how they handled those situations," Chakejian said. "By no means is our event a mockery of that. ... I would think the youth is smart enough to distinguish between the make-believe and the other." Critics argue that a haunted house on the grounds of an asylum where great pain was endured is an affront to the many tens of thousands of people released from similar institutions nationwide since 1969. Every year around this time, mental health advocates say they find themselves contending with a bevy of groups wanting to turn old asylums into haunted houses. Even though most organizers don't intend to offend, such events reinforce old stereotypes and make a mockery of serious health problems, said Mike Fitzpatrick, executive director of the Arlington, Va.-based National Alliance on Mental Illness. "We don't do entertainment projects like that for cancer or heart disease," Fitzpatrick said. "This whole sort of trend to have haunted asylums is both discouraging and very, very inappropriate." At Pennhurst, advocates say they think it's important that the site and its history be remembered — but not like this. "When we closed Pennhurst, we were trying to end abuse and mistreatment and the stigma," said J. Bruce Hulick, executive director of ARC of Philadelphia, an advocacy group for people with disabilities. "Make it a dignified remembrance, not an amusement." But Chakejian, who's had a relative treated at an institution in Philadelphia, said his project will help bring the site back to life. He estimates his group will evenually pour at least $2 million into preserving the buildings at Pennhurst. He's also tried to address at least one of the concerns by changing the name of the haunted house event from "Pennhurst Institute of Fear" to "Pennhurst Asylum." The event, with an admission price of $25, is slated to start Friday and run on Friday, Saturday and Sunday nights through Nov. 7. Part of the money will go toward restoring buildings at the site, Chakejian said, and the investors are also looking for a charity to which they can donate. He hopes this is the beginning of more development on the property, but hasn't yet decided what would be best. He said he's not opposed to an element of the site that would involve historical tours. James Conroy, co-director of the Pennhurst Memorial and Preservation Alliance, said he's glad someone is investing in the site, but the haunted house isn't what he had in mind. "We all wish there were another use that had much more dignity," Conroy said.